Oglesby is located near the confluence of the Illinois River and the north-flowing Vermilion River. It was originally called “Portland”, due to the cement mined and manufactured in the area that was similar to Portland Cement from England. Renamed in honor of Richard Oglesby, Governor of Illinois. Oglesby had excellent exposed limestone and coal, as well as riverine transport. It soon became an important center for cement manufacture. The term “Portland cement” refers to the cement developed in England; that made in early Oglesby was almost identical. The year is 1865, the last year of the Civil War. “Well, here it is,” said a Kenosha businessman who made it to the place now known as Oglesby. He was with the Kenosha Coal Company setting up operations in the untouched area south of LaSalle and the Illinois River. The company was small. It consisted of Irish, Scottish, and English workers. After one year, a shaft collapsed. It looked like all was doomed for this operation. Hope wasn’t given up through. The company sent Mr. T.T. Bent in to run the area in 1867. Mr. Bent made working conditions better. He gave them better wages and workers’ compensation due to the dangers of coal mine working. He soon started a Sunday school held in a company shed and a small grocery store. Cement has been an industry growing and changing in Oglesby for over 100 years. In 1891, the cement industry in Oglesby started. Although the land was bought in 1891 the company didn’t start operations until 1892. Richard Moyle worked there. It was just a little company and it became Marquette Cement Company in 1898. Over time Oglesby had two major cement companies. Marquette the first major company is still up and running today; but it is now known and running as Lonestar. 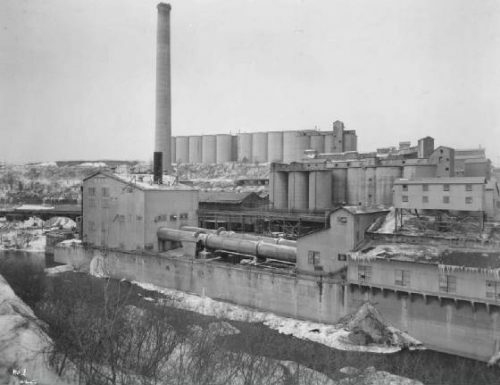 Marquette was sometimes referred to as Marquette Portland Cement. The Chicago Cement Company was the other major company, which later became Lehigh. Lehigh stopped operations in 1964 and its quarry was bought by Marquette. You can still see some of Lehigh’s old buildings off Walnut Street at the edge of town in Oglesby. They haven’t been in operation for almost forty years making it look like a bunch of ghost buildings. Finally, in 1902, Oglesby was officially a town. It was named Portland then. A name derived from Portland cement. But Portland wasn’t its first name either. Back in the 1880s Oglesby was sometimes referred to as Kenosha. T.T. Bent wanted to name this community Kenosha after the coal company, but this name was already in use by Kenosha, Wisconsin, so he couldn’t do it. 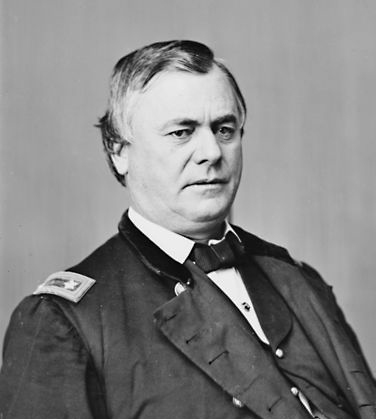 He decided to name it in honor of Illinois Civil War Governor Richard James Oglesby. In 1913, the people of Portland voted to rename the town Oglesby. Shippingsport Bridge has always been a major icon to Oglesby. 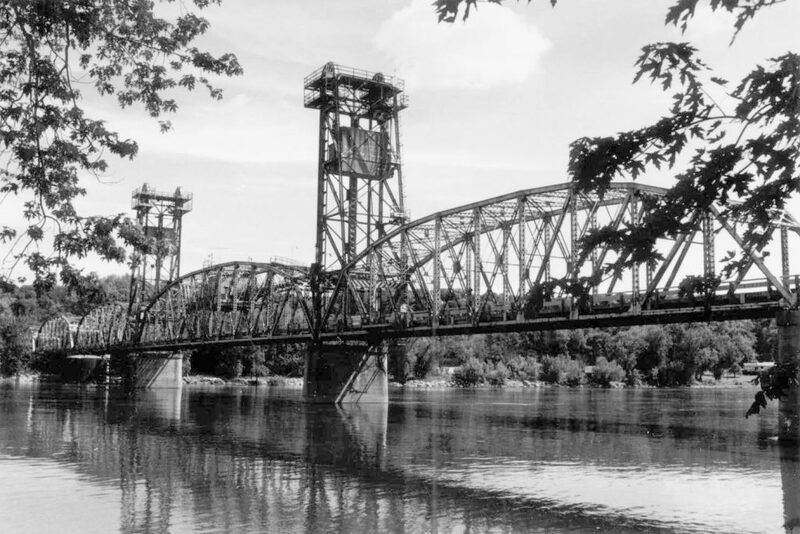 The steel, lift bridge across the Illinois River was opened on November 7, 1929. It was the main north and south road until the 1960s, when Route 51 was moved. When it was the main road though; many downtown businesses grew. After many years Shippingsport became out-of-date and primitive. Only two other steel, lift bridges are in Illinois now. In the 1990s it was no longer cost effective to keep the old bridge in operation as it broke down about twice a year. There are other bridges in the area to use such as the Abraham Lincoln Memorial Bridge serving Interstate Route 39 barely a half-mile upriver. Finally in August 2001 Shippingsport closed for good. The demolition for this old bridge started on November 8, 2001. Oglesby no longer has one of the 1,200 working steel, lift bridges in the world. *Information courtesy Oglesby, Our Home Town written by the Oglesby Historical Society. A wealth of historic photos can be found in the Photo Gallery.